I'm sure some of you remember my most recent post in which I discussed a world of mine which is inhabited by mythical creatures of all sorts. With that in mind, I'd thought of throwing centaurs into the mix, but I've come across a bit of an obstacle. You see, in my world, for every species of animal (and plant and mineral) there exists a sapient and non-sapient version, with the sapient version being distinguished from its non-sapient counterpart not only by its ability to speak and think, but also by the fact that it can stand on two legs (assuming it has legs to begin with — snakes might just be given arms) and possesses hands (not necessarily humanoid) capable of handling and manipulating objects. Basically, sapient animals are somewhat semi-anthropomorphicized, sort of like these here fellows. With most mythical creatures being a cross between at least two different species, I had the idea that such creatures appeared in my story's world as the result of a lot of indiscriminate free love having gone around after a certain quasi-god of love ended xenophobia and racism between all different species. So, this leads to the obstacle at hand: how were they able to produce a creature like the centaur? Creatures like fauns and satyrs are no problem, but the centaur? Looking at the chimera, which has the front half of a snake for a tail, I find it conceivable that an equine being could be born with the body and head of a primate where a head would otherwise be, but in what way should it stand? Would it be acceptable for the centaur to stand on its rearmost limbs and have two hoof-hands below the primate body and two primate hand above (I honestly think "why not?" because I figured all the other creatures from unicorns to griffons are going to be bipedalized. I mean, why not the centaurs) and just go by a "Our Centaurs are Different" trope? Or should I stick to traditional depictions and have centaurs with quadrupedal horse bodies and armed primate bodies on top? If the latter is favored, then how is this form produced between a primate and a sapient equine that most likely looks more or less like this? How does that sort of horse produce with a primate a being that has hooves where hoof-hands should be on a purebred sapient horse? Unless I should assume that a sapient non-human primate (please take note that I added "non-human," because humans do not exist in the world of Mythostalgia) laid a non-sapient horse during the aforementioned interval of indiscriminate free love. Alternatively to that, though, I've had the idea that every type of sapient animal comes in two varieties; bipedal forms and centauroid forms, the horse version of which would look something along the lines of this lot for example. The one problem I face with that, however, is why the gods of Mythostalgia (and yes, there are multiple gods) made two versions for each species of sapient animal. Is it just for the sake of variety and diversity and what-not? I'm really not sure, frankly. What are your guys' thoughts? In what way should I make my centaurs? 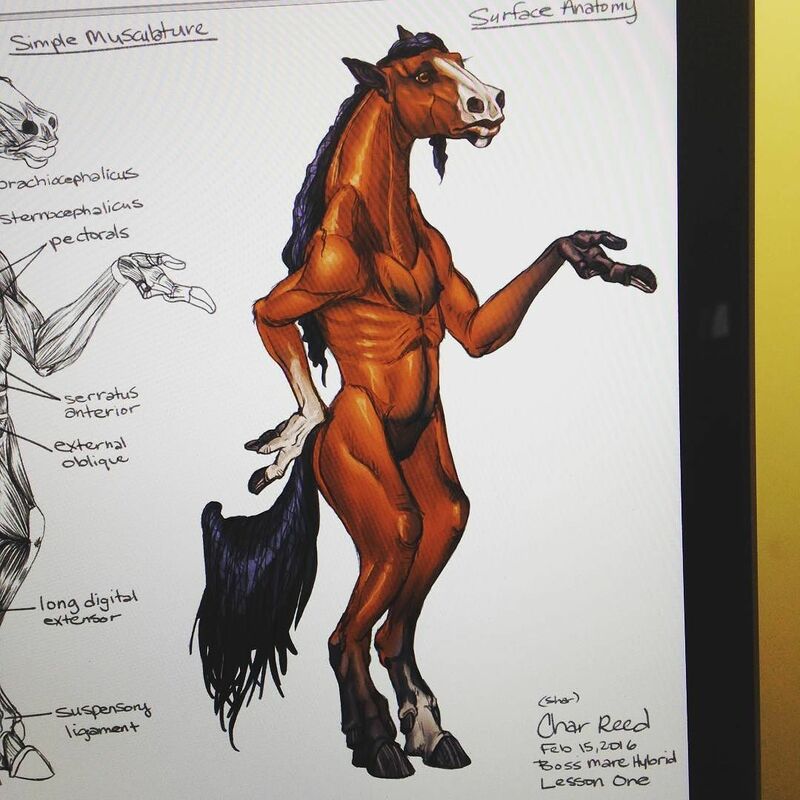 Why would both bipedal and centauroid versions be created if any of you are in favor of that? I don't have a problem with any of these. I can actually visualize the centaur standing on its rear legs and having long horse arms with what we would perceive as elbows bending the "wrong" direction with fingers able to manipulate at the end, and a humanoid head. About the two version idea, this doesn't immediately grab my interest, it seems kind of complex unless the story just has a few of them and not every species like this. Of course if you like the idea, this is what counts, and if you are having a good time imagining then go for it. eta: I just realized why I don't have a problem perceiving the centaurs standing on hind legs and with a horse head- Midsummer Night Dreams. LOL!